She started at 10. And is doing this in 4″ heels. Badass. Pelosi (D-Calif.) began talking shortly after 10 a.m., using her right as minority leader to speak for as long as she wants. 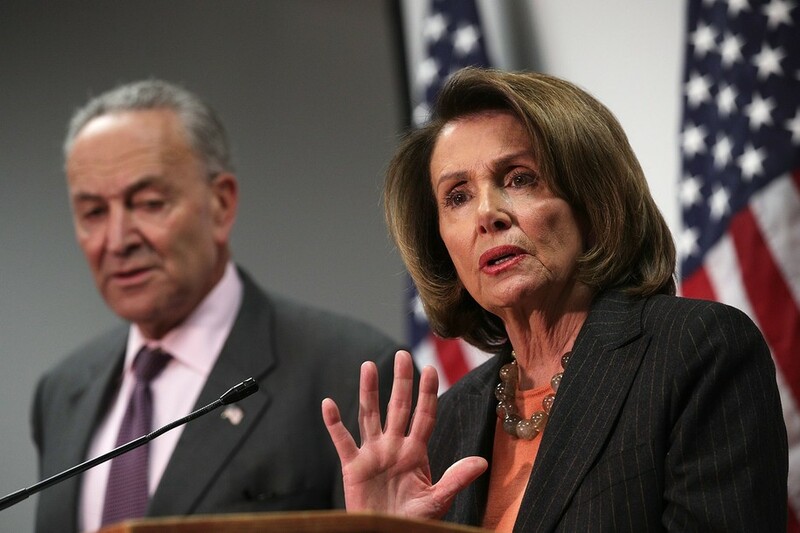 She began by saying that she would lead opposition to a broad two-year budget agreement that includes several Democratic priorities but does not address immigration — the topic that has prolonged the spending debate for several months. “I have no intention of yielding back,” Pelosi said at 3:41 p.m. Eastern as she neared the six-hour mark of her ongoing remarks. The hope is that Pelosi and Democrats — whose support is often needed to pass spending bills in the face of opposition from fiscal conservatives — can pressure House Speaker Paul D. Ryan (R-Wis.) to hold votes on immigration legislation, as the Senate is poised to begin doing next week. “Why should we in the House be treated in such a humiliating way when the Republican Senate leader has given that opportunity in a bipartisan way to his membership? What’s wrong? There’s something wrong with this picture,” Pelosi said. It’s approaching 6 hours now. You can watch on C-Span. Seven hours now. Longest speech in the history of the House. And she’s done after eight hours up there. I don’t think I could have stood around talking for that long, and I’m less than half her age. The campaign ads are writing themselves. Does she actually enjoy being in the minority? Less pressure? 2/3 of Americans support legal status for Dreamers. If you weren’t sitting in front of Fox News all day, you’d know this. Most Americans are more worried about keeping the government funded than giving citizenship to illegal aliens. If you weren’t sitting in front of MSNBC all day, you’d know this. these 2 statements arent mutually exclusive, XYZ. You’re right. A majority of those polled answered a specific scenario in a self-interested way. but the VAST majority of those polled wants to protect these people who are ALL better Americans than you. I mean, in the end, your Master’s party will gain a temporary and Pyrrhic win. The deportations will start, and one of many lasting legacies of the modern GOP will be families ripped apart at gun-point. I don’t have any TV at all, and besides Ben’s observations that these polls are different, the one I sent is recent. Get out from in front of FOX news and read your links before you post them. Let’s follow that logic. DREAMers work, pay billions in taxes (revenue to keep said govt funded), and contribute significantly (economically and otherwise) to the communities they live in. If the priority of, as you say, “most Americans” is keeping the government funded, why would it make fiscal sense to 1) Shut down that revenue stream and 2) Create and/or expand significant expenditures required to continually operate the Deportation Police? And Pelosi’s tantrum goes for naught, as usual. She is pathetic. Two year budget deal with bipartisan support including 73 House Democrats. This is what I was looking for from a Trump presidency – move away from the Congressional party line votes that were the norm under Bush II and Obama and push the loony fringes from both sides to the sidelines. Personally it’s more spending than I would like to see but overall happy to see government starting to work like it should. Sets up DACA fight that will be quite interesting. Tactically I think Rs might have lost a bit of leverage with the shutdown threat gone. They cannot present it as Dems putting illegal immigrants ahead of military, disaster funding, etc. But hopefully now we have an honest discussion of immigration and again hopefully arrive at a common sense solution. End extended chain migration (spouses & minor children OK), kill diversity visa lottery program, mandated use of E Verify, path to citizenship for majority of Dreamers/DACA. Will be interesting to see how much the Don pushes on the wall as part of the deal. Sense this will be the sticking point for the whole thing, good test of his ability to lead. And now there is a >$2B deficit hole created in the last 5 weeks. Nicely done! And I wouldn’t crow about this too much. This budget was due on September 30, 2017. The party in charge couldn’t rouse itself to get this process done in time to not have the government live for almost 5 months on CR. They still haven’t finished — the detail on the budget needs to be written AND now has a new deadline of March 23. Another month or so beyond where it needed to be done. Late budgets are not leadership, especially when you control the process top to bottom. Please. Now you care about deficits? After Obama ran 8 straight years of deficits and raised the national debt by almost 7 trillion dollars? Spare me. Nope. We’re simply calling you on your hypocrisy. Republicans are the ones who claim to care about deficits. You guys should be taking to the streets about this, and yet, you’re not. Which tells me all I need to know. I already said that it’s more spending than I would like to see – but I recognize that you can’t get everything you want out of a given piece of legislation. Unlike most liberals, I recognize that there must be some give and take on issues and purity tests are a waste of time and effort. And “taking to the streets” is an even bigger waste of time and effort. I leave that for the loony left. Deficits under Obama went from the 1.4T he inherited to about 600B when he left. The increase in debt comes from the original stimulus ($800 billion by cutting taxes, extending unemployment benefits, and funding public works projects). Other tax cuts (extending the Bush tax cuts) added $850 billion to the debt in two years. Also added debt by increasing defense spending. Add to that, that starting in 2009, tax receipts went way down because of the great recession — did not recover for some years after. So let’s not fool ourselves about this “debt” — much of it was in extending the idiotic tax cuts. And Obama did not add 2+T in deficits in his entire term, much less in a five week period. The CBO is your friend here. Your statement about deficits is a bit misleading. Yes, the annual deficit in his first year in office was about 1.4T, and in his last year in office it was about 0.6 T. But that is an annual figure, not the total. He ran an average deficit of a little less than a trillion dollars a year for 8 years in a row – increasing the national debt from about 7.5 T to 15.1 T.
Deficits count on an annual basis — in that the deficits DECREASED over the period of the Obama Presidency. A deficit this year, is next year’s debt. And when you start with a high debt number, it does increase — if anything because of the interest that accrues over the years. And for the debt incurred by the tax cuts and the rest of the Congressional spending on the DOD and others. If we didn’t have illegals in the first place, we wouldn’t have to ” continually operate the Deportation Police?” You know, those Sanctuary Liberal Cities! Hahaha. Illegals in the first place. Trolls gonna troll. You made the comment Dude, not me. xyz made the comment, not Brian. Wrongo, This is from Brian. Yea, 4″ heels that might have cost between $100 to $1000!! AND most likely tax money for security, DISGUSTING!!!!! If people are here illegally, they should be gone. No license for driving nothing. They do not deserve that right! Jesus anono, I’ll buy you a pair of 4” stilettos. Calm down. What size are you? Can’t help you there but can’t help but wonder if said heels come in clodhopper or perhaps clodhopper petite. What does anono think shoes cost? 100.00 to 1000.00 is quite a spread. That may all depend on whether they are Republican or Democrat shoes. The relevant metrics are 4″ and 8 hours. The shoes could have come from DSW. And, I’m not sure I could do 8 hours in loafers. The entire Delaware congressional delegation voted with the GOP on this 2-year budget agreement. The best Democrats the Republicans can buy.